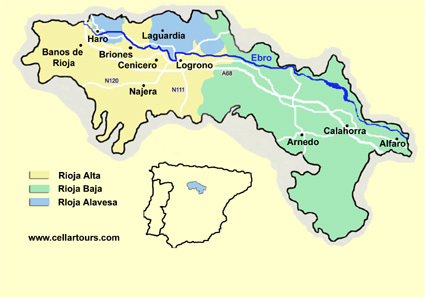 Back in the day (read: the early 90's and before) White Rioja of Spain was one of the most uniqe white wines around. Sadly, today the creeping global wine style is erasing many of these wine gems. Luckily there are still a few wineries in Spain that go for tradition and character over sameness. One in particular is Bodegas R. Lopez de Heredia of Rioja Alta (Upper Rioja or NW Rioja). 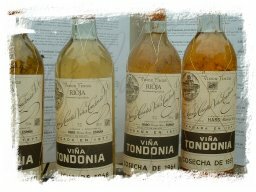 Lopez de Heredia still releases well-aged white Rioja. For example, its Viña Gravonia '91 continues to dwell on many wine store shelves. This wine is made of Viura and Malvasia. It is aged four years in American oak. (As an aside, Bodegas R. Lopez de Heredia was one of the first to use oak aging in Rioja.) Viña Gravonia is almost Sherry-like in character. It's nutty aroma and sea-salt accent bring to mind a Fino Sherry. If you see this wine, or any other well-aged white Rioja, around, give it a try. In the mouth it's very understated and delicate. Light with a creamy finish. very informative map... thanks for public this!!! Luckily there are still a few wineries in Spain that go for tradition and character over sameness. for my disgrace I never had the pleasure taste a Spain wine, but that I can see and read Spain wines have a incredible quality and flavor, are more used in different recipes.